The Vaccine and Drug Use Policy of the PigSAFE | PigCARE programs reflects the pork industry’s commitment to the responsible and proper use of veterinary pharmaceuticals in food animals. It recognizes the importance of food safety, antimicrobial resistance and the necessity of being transparent to maintain public trust in Canada’s pork producers. Canadian pork producers are proud to raise the healthy hogs needed to produce wholesome, high-quality pork. Producers understand their role in mitigating the development of antimicrobial resistance and are committed to the responsible and prudent use of antimicrobials. Antimicrobials are a key tool in any health system. Preserving the efficacy of antimicrobials is crucial to animal health, animal welfare, food security and public health. Canadian pork producers are proud to promote a comprehensive “health for all” sustainability model: healthy people living and working with healthy animals for a healthy planet. Food safety: Ensure the proper use of veterinary products to prevent drug residue in pork. Antimicrobial resistance: Encourage the responsible use of antimicrobials to reduce the development of antimicrobial resistance that could pose a risk to human and animal health. Antimicrobial stewardship: Demonstrate that Canadian pork producers are committed to antimicrobial stewardship and the sustainable use of antimicrobials. assigned by Health Canada and dosage form. a. When used per the directions on the label, veterinary drugs approved for sale by Health Canada are safe and effective. All approved products bear a Drug Identification Number (DIN) assigned by Health Canada and will appear in the Drug Products Database and for in-feed products also in the Compendium of Medicated Ingredients Brochure. An unapproved drug is defined as a drug that does not have a valid DIN, and whose sale has not been authorized in Canada. The use of unapproved drugs in swine presents a complex set of issues with potentially serious public health implications. b. For extra-label use, the veterinarian and owner bear the full responsibility for animal and food safety. 2. Medications labelled for another food-producing animal in Canada, bearing a Drug Identification Number (DIN) assigned by Health Canada and in dosage form. a. Used under the direction and prescription of a licensed veterinarian with whom you have a valid veterinary-client-patient-relationship (VCPR) and the decision to use this medication has been properly documented in that veterinarian’s medical records. c. When used per the directions on the label, veterinary drugs approved for sale by Health Canada are safe and effective. All approved products bear a Drug Identification Number (DIN) assigned by Health Canada and will appear in the Drug Products Database and for in-feed products also in the Compendium of Medicated Ingredients Brochure. An unapproved drug is defined as a drug that does not have a valid DIN, and whose sale has not been authorized in Canada. The use of unapproved drugs in swine presents a complex set of issues with potentially serious public health implications. The PigSAFE | PigCARE programs do not support the use of Active Pharmaceutical Ingredient (API) antimicrobials unless used under specific conditions. Medications labelled for swine in Canada, bearing a DIN assigned by Health Canada, or labelled for another food-producing animal in Canada, bearing a DIN assigned by Health Canada, should be selected for use preferentially over an API. If an API is used in swine in Canada it should be under the following conditions. i. The API must be manufactured according to good manufacturing practices (GMPs). ii. Individuals who fabricate, import, package, label and tests APIs for veterinary use must hold a drug establishment license (DEL). iii. Pharmacists, veterinarians or those compounding a drug under the supervision of a licensed veterinarian must hold a DEL to import medically important antimicrobials that are on List A – List of Certain Antimicrobial Active Pharmaceutical Ingredients. b. APIs should only be used in accordance with the Therapeutic Decision Cascade for Animal and Public Safety as published by the Canadian Veterinary Medical Association. c. APIs may only be used under the direction and prescription of a licensed veterinarian with whom you have a valid veterinary-client-patient relationship (VCPR). The decision to use the APIs has been properly documented in that veterinarian’s medical records. d. The PigSAFE | PigCARE programs strictly prohibit the use of Health Canada Veterinary Drug Directorate (VDD) Class 1 antimicrobials as an API. e. If an API drug is used in an extra-label manner, the veterinarian and owner bear the full responsibility for animal and food safety. a. The PigSAFE | PigCARE programs allow for the use of Autogenous Veterinary Biologics. The authority for regulating veterinary biologics, including autogenous veterinary biologics, is provided under the Health of Animals Act and Regulations. The Canadian Centre for Veterinary Biologics of the Canadian Food Inspection Agency (CFIA-CCVB) is responsible for licensing and regulating veterinary biologics in Canada. b. AVB may only be used under the direction and prescription of a licensed veterinarian with whom you have a valid veterinary-client-patient relationship (VCPR) and the decision to use the AVB has been properly documented in that veterinarian’s medical records. c. If an AVB drug is used in an extra-label manner the veterinarian and owner bear the full responsibility for animal and food safety. Veterinary Health Products labelled for swine in Canada, that have been approved and are listed by Health Canada in List C of the Food and Drugs Act and its Regulations. Veterinary Health Products are low risk drugs in dosage form. They are used to maintain or promote the health and welfare of food-producing animals. They are not for use to treat, prevent or cure disease. VHPs contain ingredients such as vitamins, minerals and traditional medicines. a. The PigSAFE | PigCARE programs allow for OUI only if the imported products have been approved and are listed by Health Canada in List B of the Food and Drugs Act and its Regulations. Under these rules no person can import a drug for use in food-producing animals or animals intended to be consumed as food (including horses) unless authorized by Health Canada. ii. The drug is in final dosage form and within commercial packaging. iii. The drug is not a medicated premix. iv. The drug is not a medically important antimicrobial on List A.
v. The drug is approved by a recognized foreign regulator. vi. The drug has established Maximum Residue Limits (MRLs) in Canada. vii. There is a comparable drug approved in Canada with a Drug Identification Number (DIN). viii. There are no unresolved safety issues with the drug or the comparable Canadian drug. c. If a drug is used in an extra-label manner, the veterinarian and owner bear the full responsibility for animal and food safety. ii. the request is submitted by a veterinary practitioners, for the purpose of diagnosing or treating a medical emergency in a patient (or group of animals) under their care. b. A drug released under the EDR program may be used only if prescribed by and used under the direction of a licensed veterinarian with whom you have a valid veterinary-client-patient relationship (VCPR). The decision to use the EDR has been properly documented in that veterinarian’s medical records. c. If the drug is used in an extra-label manner, the veterinarian and owner bear the full responsibility for animal and food safety. d. The veterinarian assumes full responsibility for the use of a non-marketed drug with respect to safety and efficacy in the intended species and drug withdrawal times relative to potential residues in food derived from treated animals. a. These are products approved by Health Canada for use by a licensed veterinarian under an Investigational New Drug (IND) certificate. b. An appropriate withdrawal time must be established with Health Canada and the VDD before the drug can be used. c. An IND may be used only if prescribed by and used under the direction of a licensed veterinarian with whom you have a valid veterinary-client-patient relationship (VCPR). The decision to use the IND has been properly documented in that veterinarian’s medical records. for animal and food safety. a. This applies to products approved for use by a Health Canada and a licensed veterinarian under an Experimental Study Certificate (ESC). the ESC has been properly documented in that veterinarian’s medical records. d. If the drug is used in an extra-label manner, the veterinarian and owner bear the full responsibility for animal and food safety. a. The PigSAFE | PigCARE programs strictly prohibit the preventive use of Category I antimicrobials. If Category I antimicrobials are used, it must be for treatment purposes only, and only if prescribed by and used under the direction of a registered veterinarian with whom you have a valid veterinary-client-patient relationship (VCPR). The decision to use the product has been properly documented in that veterinarian’s medical records. b. The PigSAFE | PigCARE programs strictly prohibit the use of Health Canada (VDD)Category I antimicrobials as APIs. a. The PigSAFE | PigCARE programs strictly prohibit the use of medically important antimicrobials (i.e, Category I, II, III) for Growth Promotion. If medically important antimicrobials are used, it must be only for the purpose of prevention (Category II and III) or treatment (Category I, II, III) and such use must be prescribed by and under the direction of a registered veterinarian with whom you have a valid veterinary-client-patient relationship (VCPR). The decision to use the product has been properly documented in that veterinarian’s medical records. Extra-label drug use (also known as off-label use) is a recognized tool in the practice of veterinary medicine for animals within a valid veterinary-client-patient relationship (VCPR). It is important for producers to know which products are labelled for use in swine in Canada and the withdrawal times for each. “Extra-label” refers to a Health Canada-approved drug being used in a manner that is not in accordance with the label or the package insert. Extra-label Drug Use also includes the use of all unapproved drugs, including bulk active pharmaceutical ingredients (APIs) and compounded drugs. Extra-label drug-use policies apply to prescription drugs and medications available over the counter, including but not limited to injectable, feed, water soluble and topical antimicrobials as well as other medications and vaccines. A WITHDRAWAL TIME must be established prior to the use of any drug in an extra-label manner. To establish an adequate withdrawal period your licensed Veterinarian should access the Canadian global Food Animal Residue Avoidance Database (CgFARAD) service. The CgFARAD is an educational and scientific advisory service which collects, organizes, analyzes, and shares residue avoidance information, strategies and algorithms with Canadian veterinarians and global partners. a. The presence of drug residues in food derived from treated animals and in the environment. b. The development of antimicrobial resistance. a. There must be a prescription for the drug with written directions that include a recommended withdrawal time. The extra-label use must be conducted under the direction of a licensed veterinarian with whom you have a valid veterinary-client-patient relationship (VCPR). The decision to use the product in an extra-label manner has been properly documented in that veterinarian’s medical records. b. Treatment records are maintained per the PigSAFE | PigCARE programs. 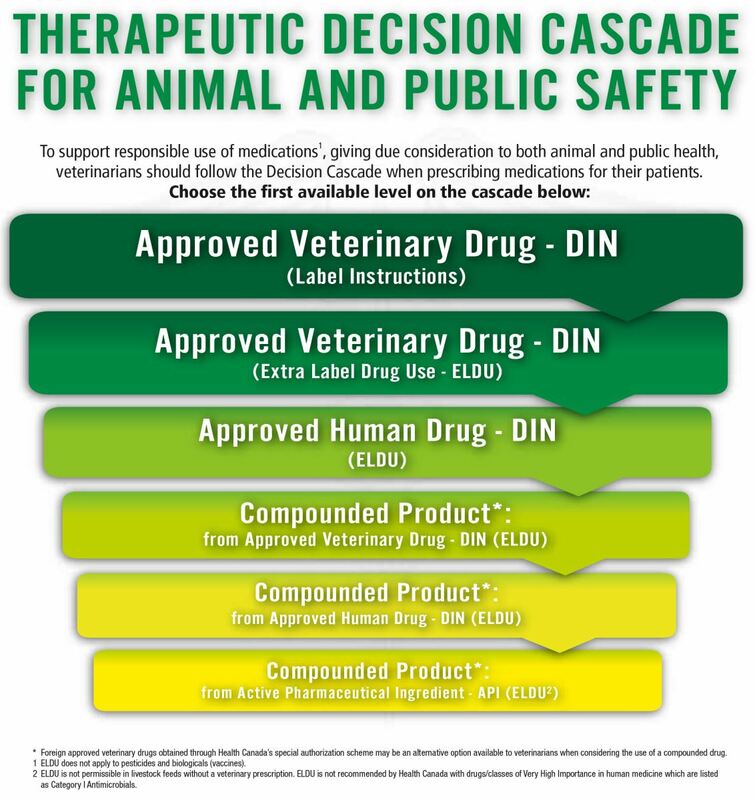 The PigSAFE | PigCARE programs recommend all medications and vaccines be used in accordance with the Therapeutic Decision Cascade for Animal and Public Safety as published by the Canadian Veterinary Medical Association. If a drug is used in an extra-label manner, the veterinarian and owner bear the full responsibility for animal and food safety.